The increasing demand for use of low-cost air sensors promises more convenient and cost-effective systems for air monitoring in many places and conditions. The electrochemical sensors first tested at laboratory and show good performance. Based on the laboratory tests, we developed different correction algorithms to compensate the impact of ambient conditions. Further, the sensors were also tested in field ambient conditions of Hong Kong side by side to the regulatory reference monitors, and the data from these tests were used to evaluate the performance of the models and validate their applicability in different ambient conditions. The laboratory tests were conducted to establish the relation of output from the selected electrochemical sensors with concentration of individual gases (NO2, NO, O3, CO) and controlled laboratory conditions. The test setup is composed of 4 major components as shown in Figure 1: 1 Standard gas generation; 2 Sensor test rig; 3 Reference gas instruments; 4 Data collection. Fig 2 shows the correlation between raw outputs voltage from sensors and standard gas concentration measured using reference instruments. Each data point represents the average values for each concentration step. As expected, the sensors demonstrated high linearity with specific gas, and R2 values are higher than 0.99 for all 4 types of sensors. This shows the electrochemical sensors perform well in stable ambient conditions. 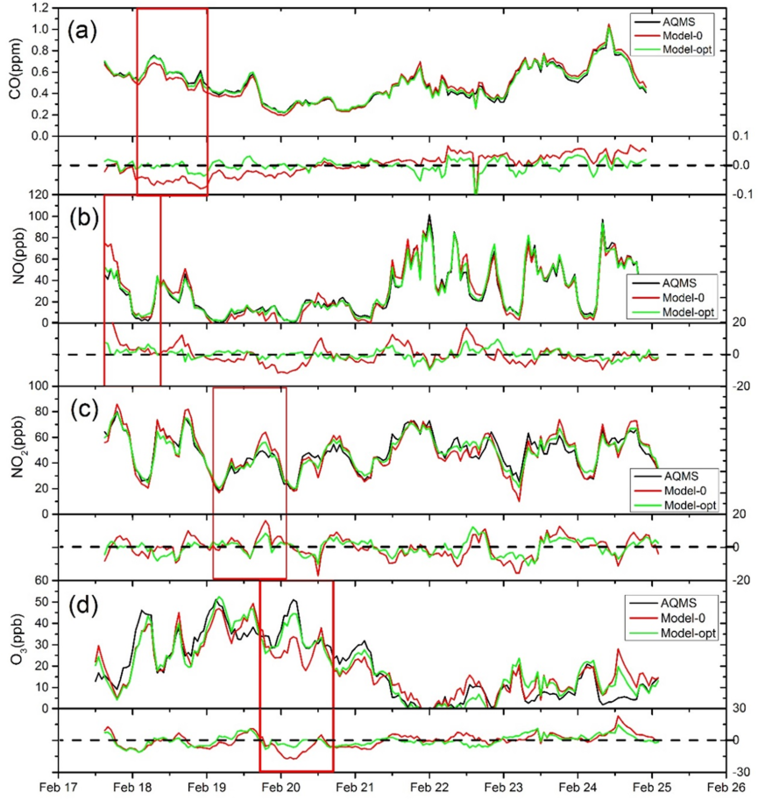 Fig 3 shows the time series of the hourly AQMS concentration of pollutants compared with the sensor data derived from uncorrected model (Model-0) and the optimal model (Model-opt) chosen from the regression analysis. 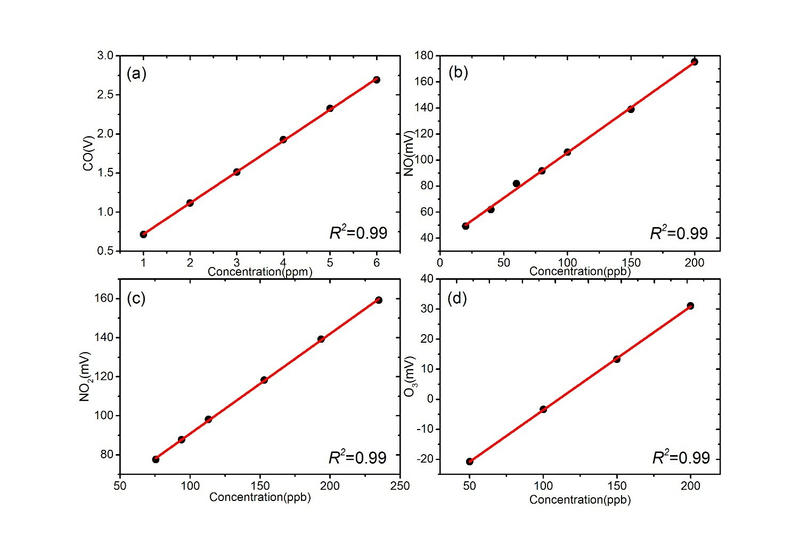 The comparison of errors between calculated and measured concentration for the two models is also shown in the lower panel of each subplot. The data used here covered entire field test period of 8 days to validate the effectiveness of the correction models in replicating desired performance. In the rectangular box the T/RH corrected model for all the sensors had a greater agreement with the AQMS data than the uncorrected model, especially for those periods when uncorrected model has large deviation, clearly demonstrating the importance of ambient condition correction for the lost cost sensors. 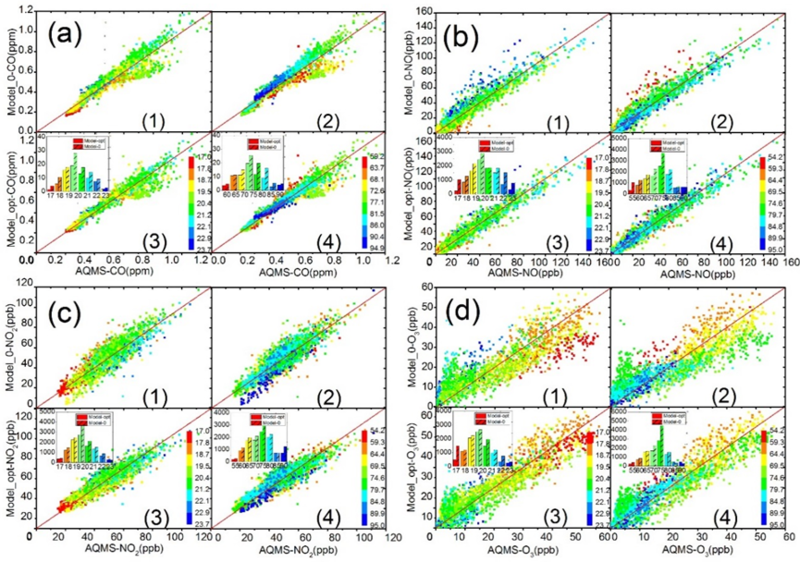 Fig 4 shows the scatter plots between the AQMS reference data with the sensor data from uncorrected (Model 0) and corrected (optimal model) models. Each data point in the scatter plot is also color coded to indicate the corresponding ambient conditions of T and RH. A 1:1 line is also shown in the plot for reference. The cumulative errors of the sensor data from two models are also plotted as the bar chart in the subplot. T and RH were equally separated into 8 bins according to the range of measured data and the bar for each bin represents the summation of the errors within the bin. Overall, the error analysis of the sensor performance shows different sensors have different characteristics and responses to the change of ambient conditions. Larger errors seem to be mostly driven by the lower or higher end of the T or RH. By applying the corrective models derived from regression including T and RH factors, the sensor performance may be substantially improved.